Upod an Kinatsila nga Ecuatoguineano (Español ecuatoguineano). 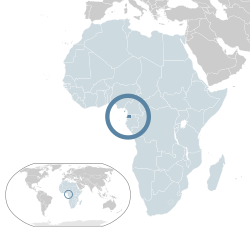 An Guinea Ecuatorial [lower-alpha 1] (ha Iningles: Equatorial Guinea, Frinanses: Guinée équatoriale, Pinortuges: Guiné Equatorial) nga an opisyal nga ngaran Repúblika han Guinea Ecuatorial (Kinatsila: República de Guinea Ecuatorial, Frinanses: République de Guinée équatoriale, Pinortuges: República da Guiné Equatorial),[lower-alpha 2] usa nga nasod ha butnga nga Afrika. Usa ini han mga lugar ha Afrika nga diin an Kinatsila usa nga ginagamit nga yinaknan, gawas han mga Espanyol nga enclave han Ceuta ngan Melilla ha amihanan nga Afrika. An kapital hini amo an syudad han Malabo. ↑ Government of the Republic of Equatorial Guinea. "Equatorial Guinea, member of the Community of Portuguese Language Countries". ↑ Government of the Republic of Equatorial Guinea. "Acts continue to mark Portuguese Language and Portuguese Culture Day" (ha Ininggles). ↑ PRNewsWire. "Equatorial Guinea Adds Portuguese as the Country's Third Official Language" (ha Ininggles). Ginkuhà 18 Hulyo 2015. ↑ Dickovick, James Tyler (2012) (ha Ininggles). Africa 2012. Stryker Post. p. 180. ISBN 1-61048-882-2. https://books.google.com/books?id=NdyYjQxd7uEC&pg=PA180. Ginkúhà dida han 18 Disyembre 2012. ↑ Equatorial Guinea. Cia World Factbook. ↑ "Equatorial Guinea country profile" (ha Ininggles). BBC. 2017-08-20. ↑ "World Population Prospects: The 2017 Revision". ESA.UN.org (custom data acquired via website). United Nations Department of Economic and Social Affairs, Population Division. Ginkuhà 10 Septyembre 2017. ↑ "2015 Census Preliminary Results". inege.gq. ↑ 10.0 10.1 10.2 10.3 "World Economic Outlook Database, April 2016". IMF. Ini nga pakli kataposan nga ginliwat dida han 19:08, 16 Abril 2019.